More miles from better math. Looks like the Honda Clarity Plug-in Hybrid will be more of an electric vehicle than previously announced. At the New York Auto Show this spring, Honda said the PHEV version of the Clarity family would have an all-electric range of 42 miles. Today, Honda sent out an email about the PHEV with a note that the Clarity is now expected to have 47 miles of range. Despite the fact that the PHEV has a gas engine for extended drives, putting 47 miles worth of battery into the car is impressive considering that the all-electric model only has a range of 89 miles. The new Clarity Plug‑in Hybrid is anticipated to receive an electric range rating of 47 miles on a single charge, perfect for your daily drives, with the flexibility to gas up and go on much longer journeys. Of course, that 47-mile range is not yet set in stone. Honda's email says that the number is an, "anticipated EPA range rating based on Honda internal data," and that the "Final EPA range rating not available." 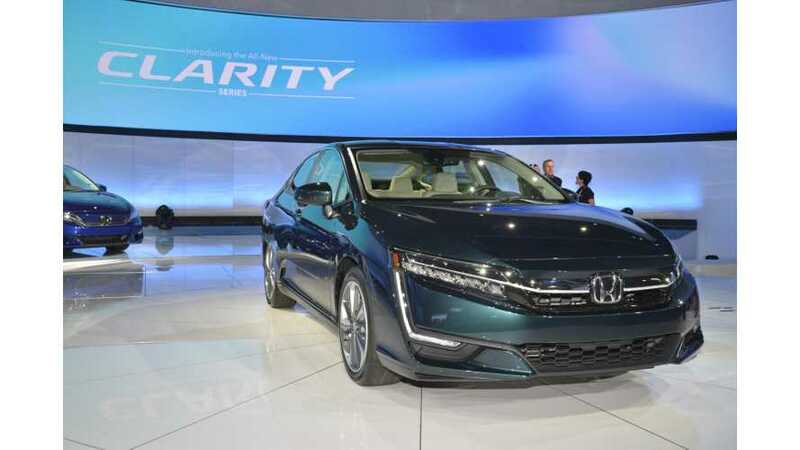 Similar wording is now available on the official Honda website for the Clarity series, so we expect that the 47 number is the accurate one, after the early estimate in New York. Whatever the official range ends up being, the PHEV is going to be the best-seller in the Clarity series. The Clarity Electric went on sale in only two states, California and Oregon, and the hydrogen-powered Clarity Fuel Cell model is available only in limited parts of California – only at 12 dealerships, in fact. This despite the fact that Honda engineers continue to say that hydrogen fuel cell vehicles are the end game for zero-emission driving. Honda is moving to electrify more and more of its line-up, with the stated intention to "electrify two-thirds of global automobile unit sales in 2030," including a focus on Europe. The Clarity PHEV is to be available nationwide, and when we spoke to Honda about the offering, they said they expected pricing to be in the "mid-$35,000" range, and available in "all 50 states". If that holds true along with this 47 mile range estimate, and Honda keeps them stocked, it should be a stronger seller. "We think the combination of a class-leading 47 miles of all-electric driving range rating and a large, luxurious 5-passenger package will give us an advantage in the plug-in hybrid game," said Ray Mikiciuk, assistant vice president of Honda Auto Sales at American Honda Motor Co. "The Honda Clarity Plug-in Hybrid represents the dawn of a new era, setting the path to a new generation of Honda products that will bring electrified technology into the mainstream." The vehicle's electromotive power comes from a 181-horsepower electric motor producing 232 lb.-ft. of torque and drawing power from both the gasoline engine and a 17-kilowatt hour (kWh) battery pack with a recharge time of just 2.5 hours at 240 volts. The Clarity Plug-in Hybrid features three selectable modes – Normal, Econ and Sport – allowing drivers to customize their experience, maximizing efficiency or driving performance. A fourth mode – HV mode – is provided to maintain the battery's state of charge and can be selected in conjunction with Normal, Econ and Sport driving modes. Expected to be the volume sales leader in the Clarity series lineup, the Clarity Plug-in Hybrid will be offered in two premium-contented trims, standard and Touring. Honda Clarity Series The Clarity Plug-in Hybrid is part of Honda's Clarity series, which includes the Clarity Fuel Cell, launched in December 2016, and the Clarity Electric, launched in August 2017. Clarity is a vehicle series offering customers an array of electrified powertrain choices in one sophisticated, spacious and comprehensively equipped five-passenger sedan, outfitted with premium, environmentally responsible materials. Offering Honda's "fun-to-drive" DNA, each Clarity variant provides a smooth, quiet and highly refined driving experience, aided by the seamless character of electric drive torque and acceleration. The Clarity series also features advanced technologies, including Display Audio with Android Auto™ and Apple CarPlay™ integration, and the full suite of Honda Sensing® safety and driver-assistive technologies. The Clarity series is at the leading edge of the Honda Electrification Initiative, which includes the previously announced intention to have two-thirds of Honda's global automobile sales come from electrified vehicles by 2030. This initiative includes a new dedicated hybrid car launching next year, an all-new Accord Hybrid, the Clarity series, and the expanded application of Honda's two-motor hybrid and plug-in hybrid powertrains to multiple car and light truck models in the future. About Honda Honda offers a full line of reliable, fuel-efficient and fun-to-drive vehicles with advanced safety technologies sold through more than 1,000 independent U.S. Honda dealers. The Honda lineup includes the Fit, Civic, Accord and Clarity series passenger cars, along with the HR-V, CR-V and Pilot sport/utility vehicles, the Ridgeline pickup and the Odyssey minivan. Honda has been producing automobiles in America for 34 years and currently operates 19 major manufacturing facilities in North America. In 2016, more than 95 percent of all Honda vehicles sold in the U.S. were made in North America, using domestic and globally sourced parts. 1 Based on 2018 model-year EPA ratings. Use for comparison purposes only. Your MPG/MPGe and range will vary depending on driving conditions, how you drive and maintain your vehicle, lithium-ion battery pack age/condition and other factors.